This is a very simple but flavor-loaded recipe that’s quick enough to make on a work day for breakfast before you leave…or for a low-effort dinner when you just need something reasonably nutritious and quick. If you’re a little skeptical about eggs with apples and onions, just think: these are the flavors we put in sausages, and sausages are great with eggs. Applewood smoked bacon is definitely a thing, and you’d eat that with onions and fried eggs. 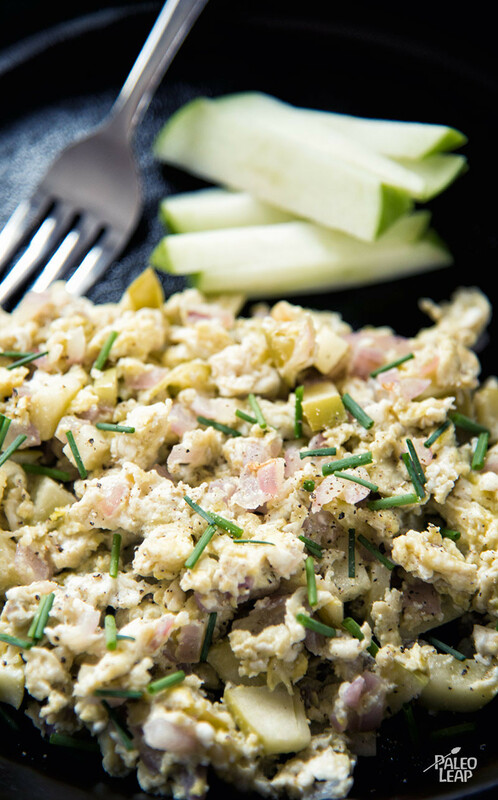 Putting the onion and apple right in the eggs is just cutting out the middleman and getting some extra flavor into breakfast. You could serve this on its own, with bacon, or as part of a brunch buffet with some roasted potatoes, fresh fruit, and other goodies. Scrambled eggs don’t keep well, but if you like the flavor, you could always adapt it to a baked egg dish like a frittata for delicious bulk-prep breakfasts all week long. SERVES: 4 PREP: 10 min. COOK: 6 min. Melt some cooking fat in a skillet over medium heat. 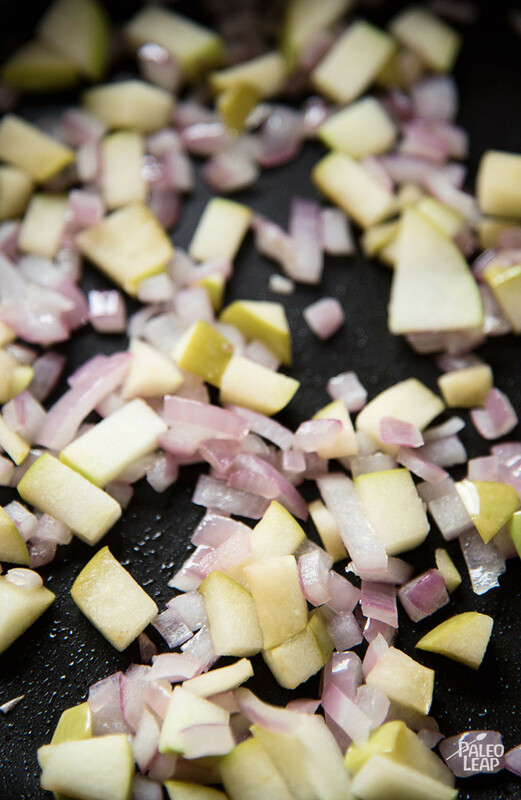 Add red onion and celery to the skillet and cook 2 to 3 minutes, stirring constantly. Add the apple and continue cooking for another minute or two. Pour the beaten eggs over the apple mixture in the skillet. Stir slowly with a wooden spoon or a spatula until the eggs are slightly underdone. Remove from heat, season to taste with salt and pepper, and rest 1 to 2 minutes in the skillet. Serve topped with fresh chives.